Bluecoat 1809 imparts a durable, soft fuller finish to synthetic textile fabrics. Finish with Bluecoat 1809 is usually carried out on padding mangle. The temperature of the padding liquor varies between 20-70 C depending upon the wetting property of the material. In case the padding liquor has been stored for a longer time, it is advisable to stir it before use. The drying temperature should not be below 80°C. When working on drying cylinders, care has to be taken that the material is well squeezed out before it is dried. 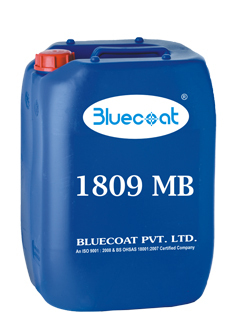 Bluecoat 1809 can be stored in cool place & should not be exposed to sunlight. Container should be properly closed to avoid skin forming. Before use remove any skin that may be formed due to surface evaporation and stir the mass with disinfected clean wooden rod to mix and homogenize the dilution that may have occurred on the top layer with settling in the lower layer. 6 to 8 months, if properly stored. Bluecoat 1809 is available in wide open mouth 50 Kgs. Carbuoys which allows complete removal of material.